Japan is crazy. Proof: they have squid jerky postcards over there. 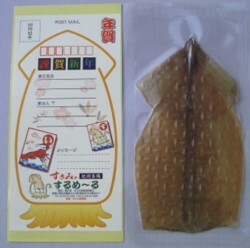 Luckily, the squid is shrink-wrapped to prevent postman hangnails getting mixed in there, but who knows; those might be a delicacy in Japan too. For under $3 each, consider your Christmas shopping taken care of.